Did you ever imagine that games like Farmville and Bar Buddy became a real application? That somewhere out there you were really taking take of real harvests and watering real plants? This thought dawned on me when Typhoon Ondoy happened and we were all helpless. Nature did take its revenged on us city dwellers. But what can we do, right? That's why I am so happy to inform that a huge company, Rexona, has taken steps in helping us internet-dwellers take care of nature the best way we know how... through Facebook! This August, Rexona has launched the first-ever reality based Facebook Application that will allow you to take care of plants for REAL!! I never had the green thumb but it seems that in Facebook games, I have quite the knack for taking care of anything that is green. I am happy that something like this has been created for those of us who are too busy to really take care of an actual plant. Oh! And did I tell you we have a REAL LIVE Online Gardener to help us out? Meet Ikey, our handsome gardener. Now, don't go Eva Longoria on him. Kidding! But Ikey is not just the only one who'll be helping us out, there is a team of people that will help out in taking care of the plant of your choice. 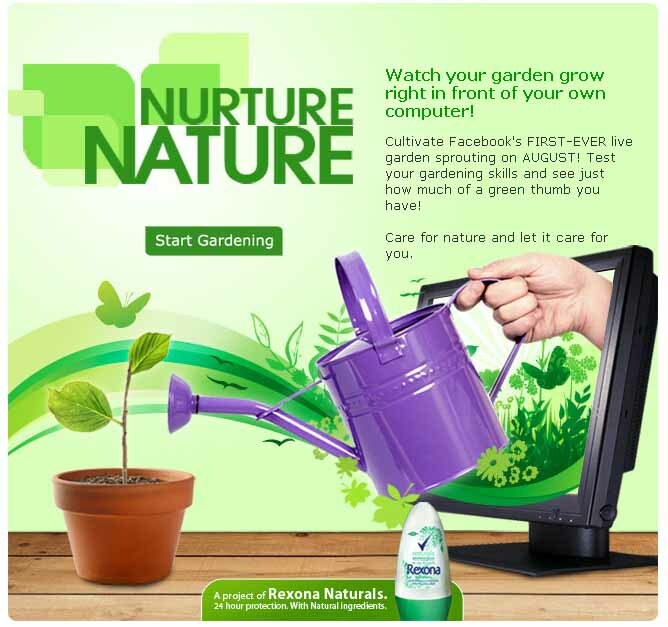 They will do anything you click on the Rexona I Heart Nature game application. Just tell them what to do and they will take care of it. Now, let's start helping out nature by clicking www.facebook.com/heartnature. Let your skin breathe with the all made for nature Rexona Naturals.